Fifty women leave everything behind to board a boat in North Africa and flee across the Mediterranean. They are escaping forced marriage in their homeland, hoping for protection and assistance, seeking asylum in Greece. Written 2,500 years ago by the great playwright Aeschylus The Suppliant Women is one of the world’s oldest plays. 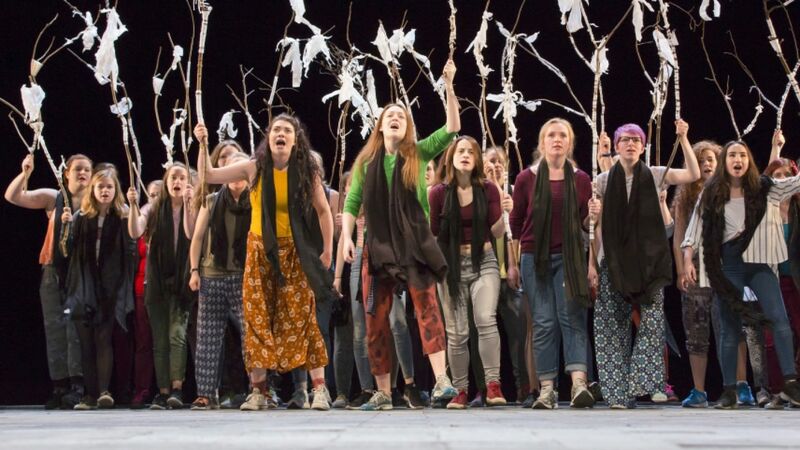 At its heart are fifty young women in full chorus arguing for their lives, speaking to us through the ages with startling resonance for our times. Reuniting the creative team behind the acclaimed production The Events – The Guardian’s best play of 2013 – The Suppliant Women uses the techniques of Ancient Greek theatre – recruiting and training the citizens of Belfast to create an extraordinary theatrical event. Part play, part ritual, part theatrical archaeology, it offers an electric connection to the deepest and most mysterious ideas of the humanity – who are we, where do we belong and, if all goes wrong, who will take us in?